To listen, you can "subscribe" to the podcast feed using a "podcatcher" application such as iTunes. After you subscribe, each time you launch iTunes, it will automatically check if new episodes are available, and if yes, it will download the most recent episode to your computer for you to hear. Then you can sync your iPod with iTunes to get the show onto your iPod for listening on the go. If you are a TiVo subscriber with a broadband-connected Series2, Series3, or TiVo HD DVR, you can listen to the Cushing's Podcasts through Tivo's new Podcaster feature. To set this up, click the TiVo button on your remote. Choose Favorites and the Cushing's Podcast will be there. Dr Rob writes in his very popular blog: "I am a practicing primary care physician in the Southeastern US, caring for patients of all ages (Board Certified in both Internal Medicine and Pediatrics). This blog covers a wide variety of issues, including the following: What it is like to be a physician, dogs driving cars, what troubles are in our system, toddlers with flame-throwers, what would it take to fix that system, llamas, death and dying issues, mutants, and accordions. Maybe I need to write about mutant dying accordions with flame-throwers. Hmmm....I feel a post coming. Anyhow, I like variety. Life is always lived with both laughter and tears. If you are a regular reader of this blog, it is also filled with nausea and nightmares. Thanks for stopping by. -Dr. Rob"
Part 2: Spreading the Word about Cushing's. Robin and MaryO discussed the role of blogs in helping to spread the word about Cushing's. They also discussed popular doctor blogs and other topics of interest to Cushing's Patients. Spreading the Word about Cushing's. This chat depended on Joselle's surgery and recovery. Unfortunately, she wasn't able to make it so her interview will be rescheduled. Robin and MaryO discussed the role of blogs in helping to spread the word about Cushing's. They also discussed popular doctor blogs and other topics of interest to Cushing's Patients. Sheryl Listen as Mary O'Connor (MaryO) hosted an interview with Sheryl. Robin Smith (staticnrg) cohosted. Charlie (creativeogre) Listen as Charlie (creativeogre) is not yet diagnosed with Cushing's but has many symptoms. He writes, in part, "I understand that Cushing's Disease is a very difficult disease to diagnose. However, it seems as though we have had to guide doctors through this process over the past year. If I sound bitter and frustrated, it is because I am! I have not been able to work over the past year. Tasks that used to take me several hours to complete now take two days. I can no longer walk the dog. Second Interview with Alicia, a Cushing's Message Board member who is still testing. Alicia returned for a Second Interview, just after her Social Security Disability Medical Screening, June 26, 2008. Alicia writes "But my life has changed significantly since my last interview, and I could talk about losing my job and applying for Social Security at such a young age. And the issues about self-esteem tied to career, and risk of depression and isolation. Let me know...will be right after my disability medical screening, I should have lots to talk about! Listen to Archived Interview February 7, 2008. Donna Sellers, President, John's Foundation for Cushing's Awareness, mother of a Cushing's patient. Donna's son may have been born with an adrenal tumor. His tumor was discovered and removed about 4 years ago. Since that time, he has been diagnosed bipolar and ADHD. Because of John's ongoing medical issues, Donna home-schools him in addition to running the foundation she started and named for John. 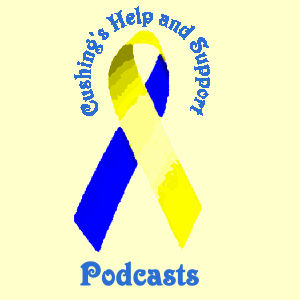 Donna helps children and families worldwide who are dealing with Cushing's. Interview with "DrDori", Dori Middleman, M.D. Dr. Dori is a Psychophamacologist and a Certified Gestalt Psychotherapist in private practice seeing adults, children, and families in the Philadelphia area. Interview with Heather S (heather_suite). Heather S had pituitary surgery on January 18, 2006 after years of medical problems, June 5, 2008. From Heather's bio: "I lived my life with cerebral palsy growing up.. I had problems with weight, but nothing really horrible like now. When I gained it was little bits, but with how active I was, I could never lose anything. When I turned 21 I graduated from college and was looking for employment, which was also difficult because people thought that I was in pain when I walked. Around the age of 22 I started to see fluid retaining in my legs.. it wasnt so bad at first.. also in college I broke my bones in my feet 3 times for no real reason. The fluid in my legs started getting worse and worse and the fluid was just leaking out of my legs. I went to the emergency room and had no insurance so I was kind of unlucky there. I went to a primary care doctor and was told that I had lymphedema and was given fluid pills. They didn't really work..."
Second Interview with Steven (sowens). Steve returned to talk about support networks and agencies. His topic was building up support networks and using available agencies to get back to work (rehab, PT/OT, job coaches, etc). Steve was diagnosed with HyperBeta Adrenergic Syndrome in August, 2005. Doctors thought he might have a pheo, now they're checking for ACC cancer. Leslie had pituitary tumors removed twice at the University Of Michigan. After her second surgery she gave birth to her second baby. She has had another recurrence and has had Gamma Knife Radiation April 3, 2008. She is not yet sure if the Gamma Knife worked yet. Interview with Jackie (samsmom) & Jordan. Jackie (samsmom) & Jordan: Cushing's in young people, the fight to diagnose, the amazing gift of a GOOD endocrinologist. Jackie has appeared on the Discovery Health tv show pilot, Mystery Diagnosis, discussing her fight for a cure for her younger daughter, as well. Monica (Monicaroni) Listen as Monica (Monicaroni) talks about the challenges she's faced maintaining her music career as a professional violinist while in testing and treatment. Monica's husband Kevin Listen as Kevin discusses his role as caretaker and spouse. At the time of this chat, Kevin was bringing Monica home from the hospital. She had just had another Adrenal Insufficiency episode. Kevin is also Monica's producer/ manager. He has been a tour manager and sound engineer in the music industry his whole life and has worked with many of the greats in the industry. Interview with Terry G (Terry). Cushing's Awareness Day Special Chat. This chat had callers and some testimonials for the website and Mary O'Connor (MaryO). Once diagnosed, she was on specially formulated hydrocortisone for 7 years as she was allergic to the fillers in the meds. Her doctor stopped practicing she and was transferred to his associate. The associate switched Jenn to medrol. Since then, Jenn has tried to wean off the steroids and has had further difficulties. Interview with Monica (Monicaroni) and Crystal (Vinesqueen). Crystal and Monica went through every step of their Cushing's journey together--tested together, had surgeries the same days, and have become best friends because of it. Interview with Karen Nolan (rooon55), part 2. Karen Nolan (rooon55) Listen as Robin Smith (staticnrg) hosted an interview with Karen Nolan (rooon55), Part 2. Karen's disease started when she was a little girl (7) and she finally got a diagnosis in 2005. She had cycling Cushing's, Thyroid disease, GH deficiency, and Auto immune Alopecia. She believes she is cured after two Pituitary surgeries. Cushing's Diagnosis and Symptoms, part 2. Robin (Staticnrg) Listen as Robin Smith (staticnrg) and Mary O'Connor (MaryO) hosted as Cushing's message board members called in to talk about their fight for diagnosis and treatment. Robin opened the show with a brief explanation of what Cushing's is and what the symptoms are. Mary O'Connor, Cushings-Help.com founder interview with Robin Smith (staticnrg). Robin Smith (staticnrg) Listen as Mary O'Connor (MaryO) hosted part two of the interview with Robin Smith (staticnrg). Robin had Cushing's for over 20 years, at least. Of course, no one figured it out or even put two and two together until her new PCP whom she found in 2004 said "endocrine". She didn't figure it out, either, but at least Robin had a piece of the puzzle and she found cushings-help.com. Robin immediately went into denial and left for several months until she got so sick she knew she had to have help. She had originally sought this PCP because she had been going to all sorts of doctors for all sorts of things trying to get help. She kept getting sicker and sicker, and it got harder and harder to do anything. Eventually, after having a bad experience with UVA, she went to see Dr. F. We went through some rounds of testing, had our ups and downs, but he stuck with me, and she got some sky high test results. Robin had to learn when to test because she was cyclical. Oddly enough, Dr. Jho, when she had surgery, insisted she was "classical" Cushing's. Robin didn't care what you call it, she just wanted to get well. Q: How are you feeling tonight? I know you just had a GH test. Do you have the results of that yet? Q: I know last time you told us about a bad experience with that bariatric surgeon. How were you treated by other doctors? Q: What can you tell us about the early testing where no one put two and two together? Q: How did you contact surgeons and what led you to pick one? Q: Many people are oddly excited and happy when they find out that they have Cushing's because it means that there may be an end to their suffering finally. For you, instead of being happy about finally having validation, a diagnosis, and treatment (surgery) you weren't happy. Can you tell us a little about that? How did you work through that - or have you yet? Q: How Robin shares her journey so others who are walking where she walked will recognize Cushing's and find help. Interview with Jennifer Shutte (JenS). Jen had Pituitary surgery by Dr. Shahinian 4/28/04, removed ACTH secreting corticotroph hyperplasia and prolactinoma. She was diagnosed by Dr. Ted Friedman with cyclical pituitary Cushings. Her second Surgery 7/21/04 for infection resulted in neuralgia. She had a BLA in March 2006 as Corticol Hyperplasia returned and she now has possible Nelson's syndrome. option after pituitary surgery has failed but has been a treatment in place of pituitary surgery. Can be unilateral in case of adrenal tumor. Laprascopic – number of incisions varies by surgeon – can be 6, 8 12, abdominal area is inflated with inert gas so surgeon has room to move, and adrenals are removed via small instruments. Walking after the surgery will help alleviate the pain and dissapate the gas. During surgery, patient is given 100mg of solu-cortef or solu-medrol. Post-op, one has adrenal insuffiency. The following information is general information – please follow your doctor’s instructions. Doctors have different preferences on replacement hormones. A normal body would have its highest cortisol levels in the morning, about half that in the late afternoon, with little to nothing in middle of the night. Dosages are usually divided to mimic the body’s rhythm as closely as possible. Of course, post op, the patent is recovering and dosages are higher for a time to aid healing. This is called stress dosing. Stress dosing is done when you have surgery, have a fever, are sick, feel nauseous, or at the direction of your doctor. Caution should be applied. Too little cortisol is harmful and as well, too much is harmful as that defeats the purpose of having the adrenals out. This was the hardest part of having the adrenals out – figuring this out. It still is. In case you run into trouble, it is a good idea to carry an “emergency kit”. A typical emergency kit contains an injectable form of hydrocortisone, a needle and syringe, alcohol pads, emergency letter from the doctor giving instructions to the emergency room, and a list of phone numbers to call. I also added to my kit a few anti-nausea pills and some hydrocortisone pills. Another good idea is to wear a bracelet that identifies you emergency personnel that you have an urgent medical issue. It is best to list if as adrenal insuffiency – steroid dependent – or even that you have had adrenalectomies so that it is clear to them that you need medical attention immediately. Unfortunately, paramedics are not allowed to administer steroids so it would help to train a spouse or friend to give you a shot. This will allow you the time to safely get to the hospital. In general, you may also need to take a mineralcorticosteroid called Florinef (although the brand has been discontinued). Salt tablets are also very helpful to keep up energy and hydration. I did not begin to lose weight until 4 months afterwards. Post op, I lost my appetite completely. Weaning, which is the changing of doses after surgery or illness, is now easy for me but for other BLA patients, has remained difficult. Doctors in general target a dose of hydrocortisone between 15-30mg. as being optimal. ACTH levels post adrenalectomies will sometimes be higher that normal – sometimes averaging around 400 (6-27). This will darken the skin. Also discussed were Cushing's patients mental issues. Interview with Karen Nolan (rooon55). Karen Nolan (rooon55) Listen as Robin Smith (staticnrg) hosted an interview with Karen Nolan (rooon55), Part 1. Karen will return March 30, 2008 to conclude her interview. Robin Smith (staticnrg) Listen as Mary O'Connor (MaryO) hosted an interview with Robin Smith (staticnrg). Q: When did you start having symptoms? What were your first symptoms? Q: What kinds of testing did you do? Q: What happened at the bariatric surgeon? Will he be more careful with his answers next time? Q: Since you started testing with Dr. Friedman, how long was it until you had your surgery? Q: How many surgeons did you consult with? Who were they? Who did the surgery? Interview with Alicia, a Cushing's Message Board member who is still testing. Alicia writes "Around the end of my Junior year, probably one of the worst things that could have happened during my 8 years of illness happened, I had severe psychiatric symptoms at school, including psychosis, and was put on a “students in crisis” plan and sent home for a little while. Being diagnosed as a “psych patient” would delay my diagnosis for years, most doctors just considered me "crazy." Items covered include what happened to make Alicia realize she was sick; psychiatric diagnosis; symptoms did you have; how the "psychiatric symptoms" were actually symptoms of Cushing's, too, and how that affects those who are trying to get help with this disease; and more. Interview with Jayne, a Cushing's patient who had pituitary surgery and a bilateral adrenalectomy before finding the true source of her ectopic Cushing's. Jayne Listen as Mary O'Connor (MaryO) hosted an interview with Jayne, a Cushing's patient who had pituitary surgery and a bilateral adrenalectomy before finding the true source of her ectopic Cushing's. Interview with Judy, the mother of two Cushing's patients, and her daughter, Jess. Judy and Jess Listen as Robin Smith (staticnrg) hosted an interview with Judy, the mother of two Cushing's patients, and her daughter, Jess, a high school student diagnosed with Cushing's. Both children have been diagnosed with pituitary adenomas and are waiting for surgery. Items covered include the difficulty in getting a diagnosis; dealing with family and friends; attending school through the diagnostic process and more. Robin (Staticnrg) Listen as Robin Smith (staticnrg) hosted as Cushing's message board members called in to talk about their fight for diagnosis and treatment. Interview with MaryO, Cushings-Help.com founder. Mary O'Connor (MaryO) Listen as Robin Smith (staticnrg) interviews Mary O'Connor (MaryO), founder of Cushings-Help.com and 20-year pituitary Cushing's Survivor. Intro: Hello, I have with us today Mary O'Connor, founder of the cushings dash help dot com website. Mary is a 20 plus year survivor of Cushing's Disease. For those who do not know what Cushing's Disease is, you may want to peruse the Cushings-help website. Briefly, it is an endocrine-related disease caused by a pituitary tumor (also called an adenoma) which causes life-threatening symptoms. Cushing's Syndrome is a similar disease caused by an adrenal or other tumor. MaryO, as she is fondly called by the members of the support board she runs in conjunction with the website, has been instrumental in educating thousands of people about Cushing's. Through the use of her website and support boards, these same folks have been able to garner support and information invaluable to their diagnosis and treatment. She has been recognized in Forbes Magazine, many newspaper and journal articles, and is a speaker at Cushing's Awareness events. She is married to Tom and has a grown son, Michael. Mary, I know the listeners would love to hear your story. What can you tell us about your symptoms, diagnosis, and treatment with Cushing's? Why did you decide to start the cushings-help website? What are some of the things that can be found on the site? What are the message boards? How many members are there on the boards? How much work is involved in keeping up the site and the boards? How are you doing now? What has happened since your surgery for Cushing's? Closing: As you can see, Mary is a survivor. Not only has she survived, but she has enabled so many others of us to survive, also. Please stay tuned for more stories from these survivors! For more information, visit the cushings-help website. Diurnal variation in diagnosing Cushing's. Robin (Staticnrg) explains that diurnal variation is one of the ways to diagnose Cushing's. It's typical of those of us who have Cushing's. Robin says "If you have pseudo-Cushing's, this variation doesn't happen. A typical/normal person has their highest cortisol around 8 a.m. and it goes down incrementally until it is around zero at midnight. This is true of a person with pseudo Cushing's, too. A person with Cushing's Disease/Syndrome will have the variation shown in the link above. It's important to have this measured. The easiest way to find out is to have late-night serum cortisol measurements (around 11 p.m.) to see what it is at that time of night. If you have elevated late-night cortisols, it indicates Cushing's Syndrome/Disease. One test in the a.m. will not tell you enough information. Stress affects everyone's cortisol. But elevated cortisol over a period of time is due to something other than "stress". And it hurts your body. Even it is intermittent (cyclical), it is very damaging, but harder to diagnose. I hope you will go for more testing. I believe you need to find a doctor who will test 8 a.m. cortisol levels and late-night cortisol levels, preferably by both salivary and serum tests. Also, high Urinary Free Cortisol (UFC) levels are the "gold-standard" for Cushing's and if high, are very indicative. However, many of us don't have high UFC's but do have high salivary and serum levels. You need MUCH more testing to determine if you have Cushing's and to determine if your diurnal rhythm is out-of-whack!" Dr. Roberto Salvatori (MaryO's Endo) Podcast. Listen as Dr. Salvatori discusses pituitary tumors.